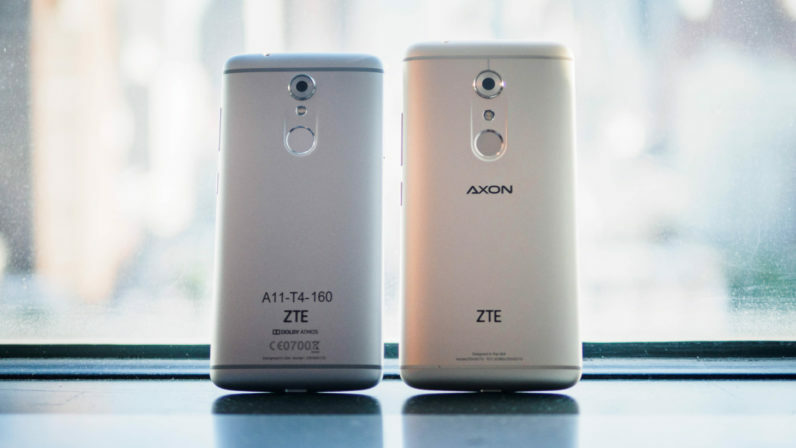 ZTE is rolling out a smaller version of its increasingly popular Axon 7. Like many downsized flagships, the Mini builds off of its larger sibling with similar design and slightly reduced specs, for a cheaper price tag. It will retail for 299 Euros, which is about $330 in the US. The main difference is obviously the reduced size, although calling it ‘mini’ is a bit of a stretch, given its 5.2 inch 1080p AMOLED display (compared to the 5.5-inch, QHD panel on the larger model). Still, it feels just as premium as the original model, but simply shrunken into a smaller body. The most notable nerfs: the processor has been downgraded to a still-very-capable Snapdragon 617, storage is down to 32 GB, and RAM is 3GB. These are a downgrade compared to the original, but should manage day to day tasks with aplomb. I certainly didn’t notice any slowdowns in the brief time with the unit, and I’ve consistently found the Snapdragon 617 to be an excellent performer with other devices like the Alcatel Idol 4S. The camera is now 16 MP instead of 20 MP, and is missing optical image stabilization. For what it’s worth, images looked sharp and clear though, and high dynamic range situations were handled well while taking some photos out of a window; low light is where the jury is still out. The display, though ever so slightly less sharp, looks great with solid colors and little of the rainbowing AMOLED panels are prone to at odd angles. The Axon 7’s excellent audio chops are still in tow, with a high quality DAC and stereo speakers ZTE says are actually improved in the Mini. The battery has been reduced to 2705 mAh from 3250, which should be largely balanced out by the smaller screen and weaker processor. It still has quick charging, but it’s limited to 2.0 instead of 3.0; it will charge to 46 percent in 30 minutes. Personally, I’m not really sure why one would spring for the Mini when the larger sibling provides better specs – future-proofing your purchase for $70 more – and isn’t that much bigger. On the other hand, it’s still one of the best phones you could buy at its price; it’s hard to imagine a phone better design or specs for much cheaper. The point is the device feels every bit as premium as the larger one, both in hand and in use. If you take your eyes off the spec sheet for a second, that’s probably all you really want anyway. The Axon 7 Mini will launch in the US in October, but pricing and an exact date haven’t been finalized.